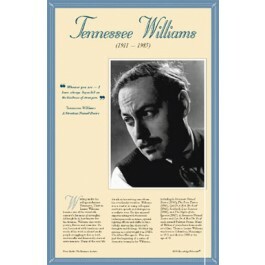 This unique educational poster of playwright Tennessee Williams features a striking photo of him, as well as a quote from "A Streetcar Named Desire," and concise biographical text summarizing his life and career. Thomas Lanier Williams wrote under his college nickname "Tennessee." He is one of the 20th century's foremost American playwrights. Many of the real-life details in his plays came from his own family troubles. Two of his plays "A Streetcar Named Desire," and "Cat on a Hot Tin Roof," won Pulitzer Prizes. 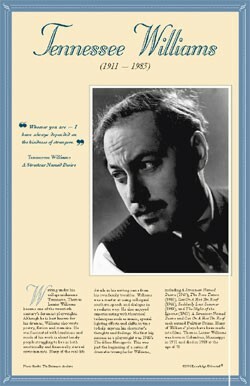 This poster is a great way to introduce students to this great American playwright.